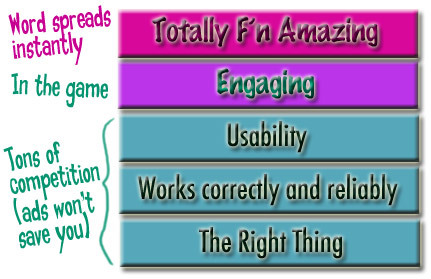 Inspired by Hugh at gapingvoid, we made this hierarchy to talk about with our other authors. But it applies to any product or service today. And the today part is important, because in the past, a big enough marketing/ad budget could win market share, even if your product was just like everyone else's. Even the biggest ad budgets can't save you today. The good news is that if what you make is totally f'n amazing, you won't need to advertise. The good folks on the net will take care of that for you, assuming you're keeping up the conversation. Level 5: the book teaches people deeply enough for them to have an "I Rule!" experience, more quickly or dramatically than they imagined or expected. Level 3: the book's order, flow and format make sense, and the language is readable (as opposed to overly academic, too advanced, obscure, or poorly translated). Level 2: the technical content of the book is correct. Level 1: the topics in the book are the right ones to meet the reader/learner's needs and goals for that subject. 1) You can't skip any of the lower levels! Level 4 (Engaging), for example, could refer to the "cool factor" of a device. The thing begs you to touch it. But if what it actually does isn't exactly what you want, coolness can't save you. Or we tell authors that even if they achieve the top four levels--the book is fabulous at pulling people in and getting them to learn some amazing things quickly, if they're weak on level 1, they're still screwed. You'll get Amazon reviews that say, "Wow, what a great book. Unfortunately, it doesn't teach you the things you really need, so you're better off buying this other [insert less interesting book] one. Too bad, because this is such a compelling book." 2) If you stop at level 3, you're stuck in the trenches fighting with all the gazillion other products and services that offer the same, good quality. So, it's such a simple formula : ) Just be Totally F'n Amazing. Then all we need to figure out is... how? * It's not about YOU. * Talk to your users. If you're Totally F'n Amazing, word will spread from the ground up. You won't have to use "fake" word-of-mouth because you'll get The Real Thing. You won't have to scare up a huge promotional budget, because all those electrons flying around the net are free. You will have to accept, though, that whatever is Totally F'n Amazing today will be Totally Expected or Totally Outdated sonner than later. So learning to unlearn is another crucial skill, because the goal is to keep coming up with new ways to be T.F.A. Keep reading Seth and Hugh for inspiration and ideas, but in the end... you just have to be willing to believe in your Big (or at least Unusual) Ideas, no matter who tries to shoot them down. Listen to what everyone has to say, then trust your passion. But our best advice? Care. Genuinely caring about improving the life of your users can't be faked, and that's an area where the "little guy" can usually beat the pants off even the largest competitors. 2) It led me to another post of yours, It's Not About You, which, I believe was one of the best things I've read in a long, long time. Thanks for the great, mind streching content and please don't be afraid of caps and asterisks ! They only reflect our speech in print. Yes, I know you get heat, but it's only from a boring coder and he's probably so monotone that he can't keep a date awake with double lattes ! If a person, especially a passionate blogger can write with no caps, no italics and no symbols...he/she is wasting his/her time. You don't speak without passion...don't write without it ! I have to print out this post and hang it in the office. So many times, stubbornly forgetting to take care of the first essential levels in order to try to immediately make something TFA, has first of all costed so much time that at the end something isn't either TFA and doesn't even work when it should. It's so crystal clear, thanks a zillion!! Kathy, you're my hero. It's a shame you've left the game industry - it needs more people like you. Keep the posts coming! Kathy, Hugh and Scoble and Seth have nothing on you...the depth and clarity of your writing is pretty damn awesome. please continue to be prolific and provide us a daily dose of wisdom and entertainment. thanks. This is a TFA post! I should never forget your best advice in the last paragraph when I am coding. ETC and also offerring buyers/customers our yearly bonaza. We are offering very low discounts for our new customers/buyers,so place your order with your full address, zip code, and phone contact numbers to enable proceed with the transaction. We are a professional exporter of consumer electronical products.Main products include portable DVD player, TFT LCD monitor, Mobile phones, they are 100% brand new set. arrive within 2/3 Days Via Either FedEX/DHL or Ups Courier Sevices.